Jorge Lorenzo, who started from the front row after yesterday’s pole in qualifying, had an unfortunate race. 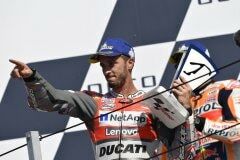 The Spanish rider led for the first five laps and after being passed by Dovizioso, was involved in a terrific battle with Marquez. Two laps from the end, while lying second, Jorge crashed at the Quercia corner, after which he got back on his Desmosedici machine to finish the GP in seventeenth place. 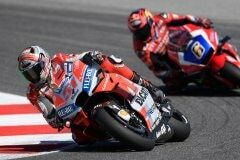 It was a tough day for Michele Pirro on the third Desmosedici GP of the Ducati Test Team. Michele, who started from row 5, finished the race in fifteenth place. 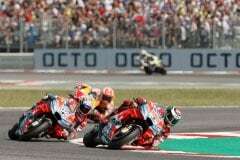 The next MotoGP round is the Aragón GP, scheduled to take place on 21-23 September at the Motorland Aragón circuit on the outskirts of Alcañiz.